Thank you for taking a moment to learn more about Claims Pro Restoration. We understand that many times your home is your largest investment. We take great pride in treating your home the same way that we would treat our own. Please reach out if you have any questions. Claims Pro Restoration provides Storm Damage Restoration Services for residential and commercial properties with a focus on insurance claims. Due to our relationships with many of today’s most popular insurance carriers, we are able to handle most any claim at a moments notice. 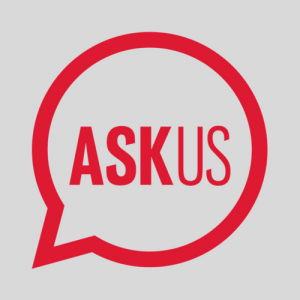 While we are not public adjusters we do have licensed insurance adjusters on staff and are approved repair vendors for most major insurance carriers. Our first goal is always to ensure that your property is restored back to pre-storm condition focus on ensuring this process completes as quickly and painless as possible for our customers. There are many moving parts when it comes to completing an insurance claim and you can rest assured that Claims Pro Restoration is here to help you every step of the way. Please reach out today with any questions. 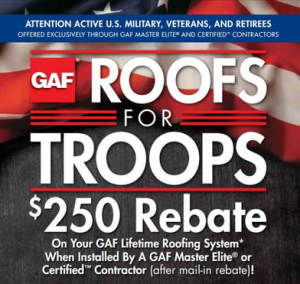 We are proud to partner with GAF as a certified contractor to be able to offer discounts to all active U.S military, Veterans, and Retirees. 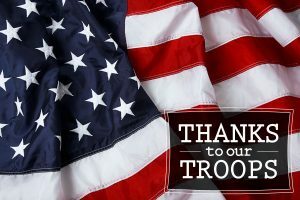 The job performed by our Military members is amoung the hardest in Nation if not the world and we are honored to be able to give back whenever possible. Please accept this heartfelt “THANK YOU” first and foremost and if we can help you through your storm restoration process then all the better. If you suspect there may be damage to your home from a recent storm, Let us help you get your home back in order and say a small thank you for your service at the same time. Contact us Today! Claims Pro Restoration is a leading provider of high-performance, high-quality roofing solutions for residential, commercial and multifamily properties. As a leader in Central Texas, Claims Pro Restoration provides an uncompromising level of quality and service to its clients and has earned a solid reputation for excellence in the roofing community. Our philosophy is to offer and install the best roof possible for every situation. We do it right, taking no shortcuts, the first time. We pride ourselves on developing long-term working relationships with our clients and believe in providing our clients with the very best, so we take care of everything! We provide our services to home owners and small businesses that recognize the value of hard work and creativity to find the best possible solution for each project. No matter what size project or scope, we can take the client’s vision and make it a reality. Let us help you navigate the insurance process in regards to your storm damage. Don’t assume your insurance company is on your side. We encounter many different projects in our travels and if we cannot do it we are happy to refer you to someone that can when possible. Why choose Claims Pro Restoration? At Claims Pro Restoration we believe that excellent customer service is the foundation for reaching optimal customer satisfaction and building a trusted working relationship with our clients. We guarantee our customer’s expectations are not simply met, but exceeded. We believe great customer service begins with our company’s integrity and dedication. Our team members are knowledgeable and hardworking professionals dedicated to your project’s success. We are committed to your satisfaction. We are never too busy for any of our potential customers, new clients, or long-term customers. We take pride in every project and enjoy working with our customers to continue building the southeast. Because Claims Pro Restorations goal is to always perform above industry norms, we consider the products we use—whether roofing, gutters, doors, windows or other materials—to be extensions of our reputation. We use only the highest quality products, from reputable manufacturers. 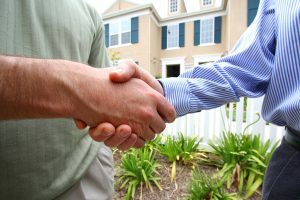 We have forged strong relationships with several companies to bring you superior products for exterior home services. Our roofing, windows, gutter systems, and other home remodeling products will provide many years of worry-free performance. Our roofs come with our leading shingle manufacturer’s Lifetime Limited Warranties. Our windows and doors also come with manufacturer Limited Lifetime Warranties. All our services come with one of the industry’s best workmanship warranty. In Central Texas, the storm restoration and general contracting company to turn to for the best customer service, the best home remodeling and improvement products, and the best warranties is Claims Pro Restoration. We look forward to showing you what we can do for your property. Claims Pro Restoration came to be after the owner, Brian Lefaive, held a couple of project management positions with large storm restoration companies here in central Texas and saw what was missing in the industry first hand. What was missing you ask? GREAT customer service and the follow-up. Contractors doing what they said they were going to do. Many of you may know this already but the construction industry is full of flakes and people that do not know what it means to provide truly great customer service. Brian grew up in the hospitality business and worked all over the country for some high profile companies. There, he learned that great customer service was the life, blood, and heart of a business. Brian put Claims Pro Restoration together to be different from the industry norm. Along with great customer service, we find great importance in harboring relationships with our insurance agents and adjusters. At Claims Pro Restoration, our management has background working in the insurance industry which gives them an advantage in supporting the insurance companies and our clients when resolving insurance claims. Brian is a former insurance adjuster that stays up to date with his licensing and continuing education so he can bridge the gap between contractors, our clients, and their agents. The contractors and crews are the best in central Texas, with years of experience, specialized training and manufacturer certifications. The goal of Claims Pro Restoration is to exceed your expectations and provide the best customer service in the industry while providing top quality workmanship.